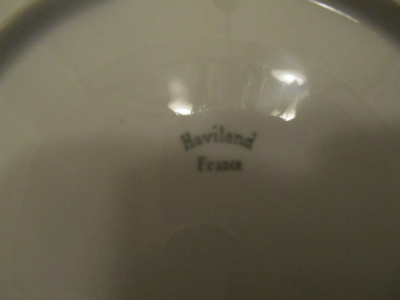 Dear viewers, we have an exquisite Haviland cabinet plate for you! 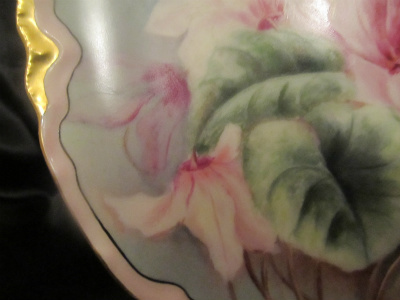 This handpainted plate has a soft pastel background changing from pink, to soft yellow, to varying shades of green, with a foreground of expertly painted cyclamen leaves and flowers of the softest blush tones with maroon veins and centers. 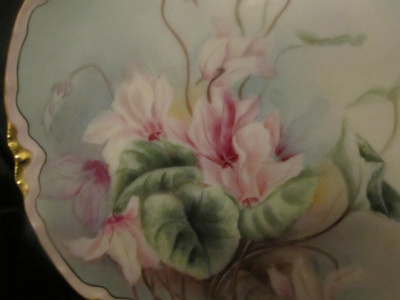 As you know, the cyclamen is a most unusual subject for a cabinet plate. 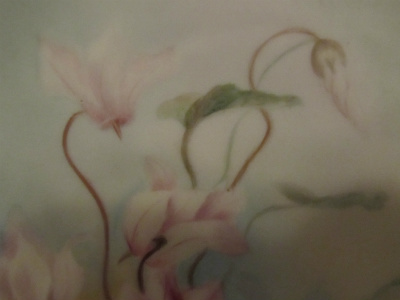 More typically, one is likely to find roses, chrysanthemums, violets, even edelweiss as the subjects of porcelain art. Not only is this plate unusual in its subject matter, but it is a lovely and expertly delivered work of art as well. The outer border of this 8-1/2" in diameter plate is marked by a thin, wavy line of black (we marvelled at the deft and sure hand that drew this line, for there is only one point where the painter's brush went slightly astray --- see our photographs), followed by a pink border of approximately 1/4" in width, and gilding at the border's eight dip points and around the outer rim. The mark on this plate places production of the plate between 1894 and 1931. Beyond that we cannot say more, for neither the decorating studio nor the artist left their marks on this lovely piece. This cabinet plate is in excellent condition, with no nicks, chips, cracks, or any variables beyond a few small glaze pops and some clay bumps that survived the firing process.